Samaira is quiet grace and gentle beauty. Her coat is a deep, warm brown like summer soil, and in the sun takes on subtle mahogany sheen. From her shoulders sprout two massive wings, large enough to carry her body through the air with ease. The feathers of her wings are the same brown as her coat, but the very tips of the tops of her wings are pure, snow white, and mixed in here and there are a few strange feathers, almost gold in color. 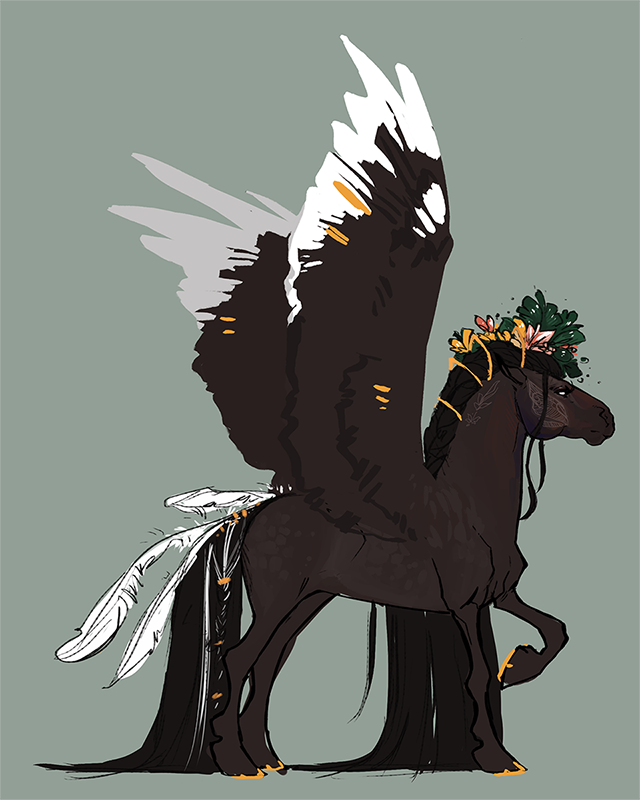 Her hooves appear to be dipped in a similar color as these feathers, giving her the appearance of horse shoes though she does not have any. Her build is compact and muscular, but by no means bulky. Her neck is thick and her profile slightly convex. Overall Samaira’s build is like that of a finely carved statue, strong and yet elegant. Straight, smooth and long, both her mane and tail drag on the ground. Her hair is dark, almost black, except for a few stray strands of in her tail. The hair along her neck is braided before it falls loose to the ground at her shoulder, and there is one small braid in her tail, containing almost all of the white hair. Her eyes, in contrast to the overall dark of her, are an almost white silver, bright and expressive. Apart from her eyes, and the flowers woven with gold into her hair, the only other striking feature are her three tattoos .The most noticeable is the intricate butterfly’s wing on her right cheek, the other two a symmetrical vine and leaves on each side of her neck. The tattoos are light brown, nearly white in color, delicate and subtle enough to not be visible from a distance. Please note that at this time, the feathers are not part of her character. Samaira has had no choice but to be brave all of her life, growing up in a world where she did not belong and was not wanted by most. But she wielded her bravery with kindness and gentleness, not with walls and weapons and harsh words. Through all her struggles, she has remained strong, a fighter; even when it seemed like all hope was lost, Samaira never lost sight of herself. Her parents instilled in her a great sense of person, and with their loved showed her that no matter the cruelty of the world she could still have compassion. Still, there is a sort of sadness to her—a somber set to her shoulders, a contemplativeness to her silver eyes. It’s not pity, not the tinge of loss or heartache, but perhaps it comes with her reservedness; the overwhelming desire she has to connect with others but the struggle to reach out after so many years of being on her own. Samaira is soft-spoken but sure and at times bold, and all of her words are meaningful and often full of the sort of insight only someone who has been through a lifetime of experiences can offer. Samaira has an almost childlike thirst for knowledge, eager to learn new things and often asking questions. She can be quite cautious in new surroundings and with new people, understandably so for her history has only taught her discretion and vigilance, and yet, maybe because of her desire to find kinship, she is very fond of the company of others. When given the chance to have her moment to feel it out, you might just see her settle in open up, like a flower in spring. This adaptability comes from her family having to move more than once when she was young, forcing her to become used to starting over. In a world where all equines we're grounded, Samaira's parents raised her in a small forest cottage, afraid their daughter might lose her wings or that they might lose her so they kept her hidden. She had no friends but the woodland creatures, nobody to play games with but herself. Until, one day, Samaira stumbled into a boy, tall and not quite grown into his legs yet, but with a kind smile. He did not care about her wings and they became fast friends. For many months they met in secret, in a small forest go. In time she discovered he had been in the forest that day searching for a flower, one which he never found. Samaira made it a mission to find it, and to give it to him as a gift. It took her many days until finally she spotted it growing from the branches of a tree high up in the canopy. Seeing no way to reach it but to fly, Samaira braced herself, and after making sure none were around, she flew up to retrieve it. When she touched back down a gasp from behind her caused Samaira to startle. Her wings snapped back to her sides, and eyes wide, she turned around. There stood her friend, not with a look of disgust or hated like she expected, but awe and wonder instead. “I've never seen them open like that,” he exclaimed, stepping closer to her. Slowly, perhaps too quickly still, Samaira relaxed. “You are beautiful. They are beautiful.” At those words, Samaira's heart soared higher than her wings could ever go. At those words Samaira found she'd fallen in love after All the time they had spent together. From that point on he seemed to become enamored with her wings, asking her to unfurl them for him, to spread one over him when they laid together in the sun. He drew them a lot, as though studying their make-up. She begged him not to show the sketches to anyone but found she could not ask him to stop making them altogether; her, a lonely girl who wanted to be loved. Then he came to her one day, wild eyed and out of breath. He told her that his mother had found his drawings and demanded to know where he had seen the wings and who the mysterious girl in the drawings was. He refused to tell, but his mother threatened to turn him in to the King for treason. His apology fell on deaf ears as the truth sank in: her family was in danger and she needed to warn them. She left him standing there, staring after her, as Samaira raced for home. Without any idea of how much time they had, they were forced to abandon everything and leave immediately. Samaira would never forget the looks on their faces, though they tried to understand why she had grown so close to a stranger in a world where she wasn't supposed to exist. Over time her family managed to settle down and begin to build a new life and home. Samaira was perhaps more reclusive than ever. She could not know what had become of the boy she loved or the place she had called home, but she could not find it in herself to trust again that they would ever be safe. Still as days turned to weeks, to months, to years, she found herself opening back up. And as time was known to do, eventually it took her parents from her, who aged and passed rather peacefully a few weeks apart. She would miss them, but she would continue on. Then, it was only Samaira. She thought perhaps her heart had at last forgiven, or forgotten, the boy as it no longer ached like it once had. She had not met another equine since those whimsical, wonderous days and she had no desire to, having come to the conclusion that seclusion meant safety. Fate, however, appeared to have different ideas. Fate, like a lot of things, had a mind all its own. She'd been picking berries when someone walked up from behind her, silent as a ghost. Samaira almost didn't recognize him for how much he had grown, changed. There was a confidence to the set of his shoulders and a strange distance in his eyes that she wasn't sure if it was real or if she was imagining it. Regardless, her heart fluttered like a broken thing trying to come back to life, even as her head remembered what had transpired all those years ago. But he smiled and said her name and it was as though nothing had ever changed. He told her that the day she left he has gone home, packed his things and left as well. He'd spent the last years traveling and hoping he might one day find her again. Looking back, he'd said all the right things to get her to let him back into her heart. The only problem was she'd had no clue of his agenda. In their separation he'd become obsessed with the idea of wings and flying. He'd spent more time studying birds and forbidden texts than eating or sleeping, until one day he'd found a spell that would let him manifest elemental wings with merely a thought. Then he'd spent all the money he'd had to pay a sorcerer to cast it on him. He didn't tell Samaira any of that. At least, not immediately, and when he finally did, he didn't get the response he was hoping for. Samaira had been aghast, panicked, even accusing. She'd told him that he was crazy, that if anyone caught him he'd be killed. She'd asked him if he remembered how his mother had reacted, and why he would put himself and her in danger. Again. Her fears seemed to have no effect on him, he thought only if she saw them then she would love them like he did. The strangled sound that left her lips he mistook for awe. He claimed they were beautiful, he claimed that the two of them were not different anymore. It was then that Samaira realized the truth, or perhaps she had known it all along and had chosen to ignore it. The only part of her that he had ever loved was the part that isolated her from the rest of the world. What a fool she bad been. “I don't want children,” she'd told him, “I could never put a child of mine through this life.” He looked like he'd been punched, the disbelief in his eyes was clear. Would all his dreams, every minute of these last years be a waste? “I thought you loved me?” he asked her. And she had, and maybe she still did. But Samaira could never spend the rest of her life with someone who did not love a of her. She would rather spend it alone. Then she told him to go, and the words shattered on the ground like glass. Those words would put a chasm between them far greater than any Samaira had with the rest of the world. And leave he did, and she did not see or hear from him again for many days. The first sign Samaira got that someone was wrong was the silence. It was a warm, sunny day but there was not a creature to be seen or heard in the forest. Something had scared them, but what? She never could have guessed that he would have taken the rejection so badly, that his obsession could have pushed him to revenge. She couldn't have known that if she wouldn't share her wings with him that he would have them taken from her. When she heard the sound of movement in the underbrush however, not from just one body but many, Samaira knew that's exactly what he had done. In the time it had taken her to reach the meadow, the sky has grown cloudy overhead. If Samaira could make it above the clouds she would be safe. He wouldn't be able to follow her unless he wanted to give himself up. It wouldn't be easy, though. She'd have to fly farther and faster than she ever had in her life, but it was her only chance. With a thrust of her wings and a shove of her legs, Samaira was airborne and every downstroke brought her closer to freedom and safety. She knew the soldiers had cleared the trees when the first arrow whizzed by her, followed by another, and another. 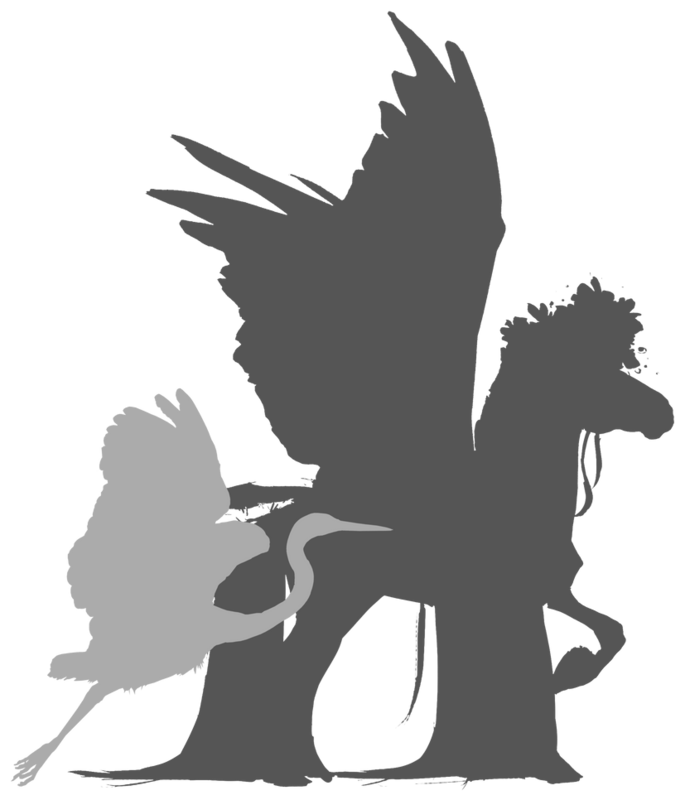 One of them grazed the curve of her barrel, a second passed between the feathers of her right wing, but it was the third that hit its mark, nestling into the joint of her left wing. Unable to continue, Samaira began to fall, the wind and the sound of her scream whistling past her ears. Thinking that this was her inevitable death, she would rather die than to lose her wings or to have take his offer. If this was how her life was going to end then she tried her best to accept it as she steadily plummeted toward the earth below. Samaira passed out at some point before hitting the ground. 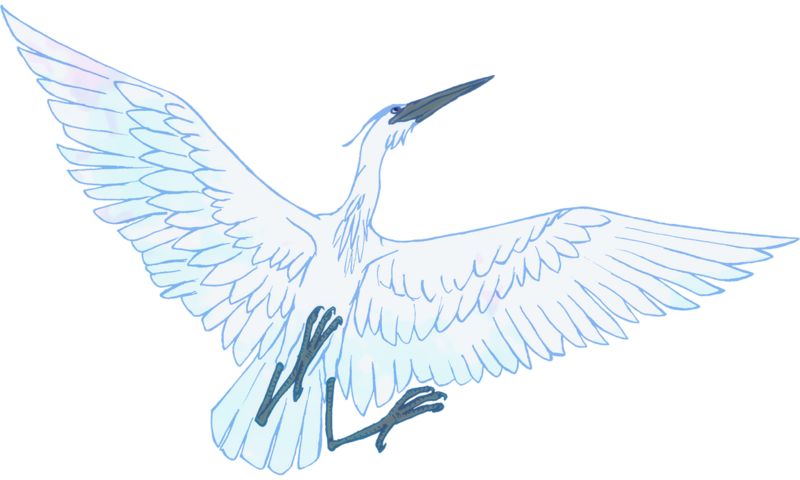 From a distance, Alaunus would appear to be just a white heron, snowy feathers shining brightly in the sun. But get closer and you will see the subtle blue iridescence to his plumage, faint and dancing with each movement and reflecting his surroundings ever so slightly. When it comes to his size and build there is nothing fantastical about him, save for the fact that he is slightly larger than his natural brethren. He stands roughly 4.5 feet tall with an impressive wingspan of just over 7 feet. His beak and legs are almost steely blue in color, and his eyes as an early morning sky: soft and blue. He has a small crest of long, thin feathers on his head, which usually lay back against his skull. His overall appearance is of great beauty and elegance, with a long, delicate neck, nimble body and towering legs. Alaunus is quite the character. Still relatively young, he has seemingly endless stores of energy and a healthy sense of humor to guide him through each day. He can be incredibly chatty, even in the most inopportune moments, and loves nothing more than to carry on a conversation with his bondmate. Oftentimes, he may even just chat to himself, or to anyone around (though they cannot understand him, he likes to think they're interested in what he has to say). He has a penchant for playing games, even when he shouldn't, and likes to make the most out of every moment. Still, despite his childish antics, Alaunus has a gentle and nurturing side to him, and a wonderful gift to go along with it—healing abilities. Alaunus can heal minor and superficial injuries (scrapes, cuts, strains, and similar), and while he cannot repair serious or life threatening injuries he is able to alleviate some pain and provide comfort to those in need. Some more serious injuries he can heal over multiple sessions, but he must always be in contact with the injured to use his abilities. When it comes to adornments, Samaira has a few. In her mane she weaves flowers and leaves in salmon pink, deep green and warm amber, and these are secured by thin gold rings that loop through her braid, four of them, down the length of her neck. The small braid in her tail is held by similar, but much smaller rings.